The history of the death penalty in Ohio dates back to the 19th century, but the most recent enactment of capital punishment was made into law in 1981. In 1981, Ohio General Assembly re-enacts death penalty based upon “guided discretion;” a response to the U.S Supreme Court decision’s in Lockett v Ohio (1978) that rejected Ohio’s earlier attempt to rewrite the death penalty statute in 1974. In 1993, Governor George Voinovich (R) signed a bill into law that adopted lethal injection as an alternative option to the electric chair. 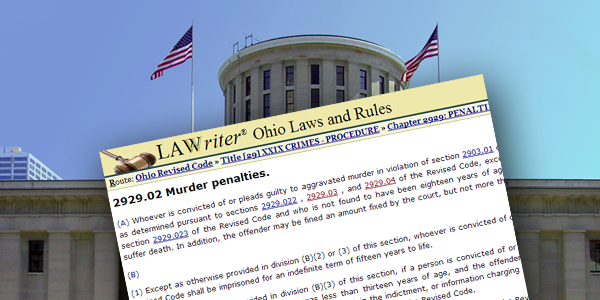 In 1995, the Ohio legislature added Life Imprisonment Without Parole (LWOP) as a sentencing option for aggravated murder. In the same year, the Ohio constitution was amended to limit the authority of the Governor to provide clemency or commutation by allowing the General Assembly to draw up rules for the process. In 1996 and 1997, Ohio lawmakers expanded the original death penalty statute by increasing the range of crimes that were eligible for the death penalty. Consequently, the expanded statute made it easier for county prosecutors to seek the death penalty more frequently. The Joint Task Force to Review the Administration of Ohio’s Death Penalty recently recommended narrowing the range of crimes eligible for the death penalty. In 2001, Governor Bob Taft (R) eliminates the use of the electric chair by executive order. In 2003, Governor Taft commutes the death sentence of Jerome Campbell to life without parole after DNA tests cast doubt on Campbell’s guilt. In 2007, the American Bar Association found that Ohio does not comply with 93% of the established guidelines for an “ideal” capital punishment system and thus recommended a moratorium in Ohio. In response to these serious concerns, Ohio Supreme Court Chief Justice Maureen O’Connor announced the creation of a task force in 2011 to examine the procedural errors in Ohio’s death penalty. In 2014, the Ohio Supreme Court Joint Task Force to Review the Administration of Ohio’s Death Penalty published a report containing 56 recommendations that would address the shortcomings of Ohio’s death penalty system. You can see the recommendations here.